The underlying theory about current mirrors etc is skipped but might be added at some point. Differential amplifiers amplify a voltage difference at the input and are fundamental circuits in electronics. They are used in operational amplifier circuits and when ever a differential signal need to be amplified. 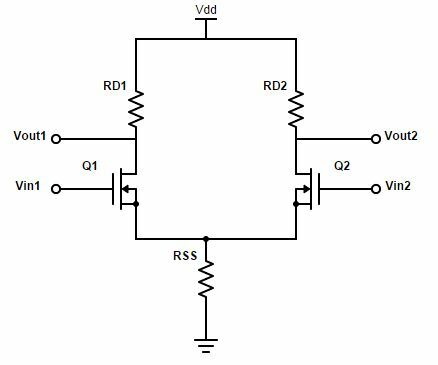 Differential signals do have the advantage that they are immune to crosstalk and noise as those influence have no impact on the difference of this voltage levels. see SRAM technology. 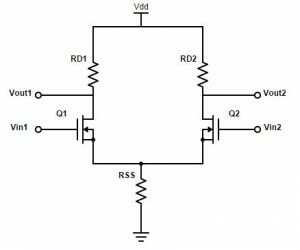 The principle is that a rising will reduce the voltage at . This will reduce the voltage over and will lead to a lower current in the right path which is causing to increase. We need a Resistor to make sure that both Transistors stay in Saturation Region. The Overall gain consists of 2 parts, the differential gain and the Common mode gain . 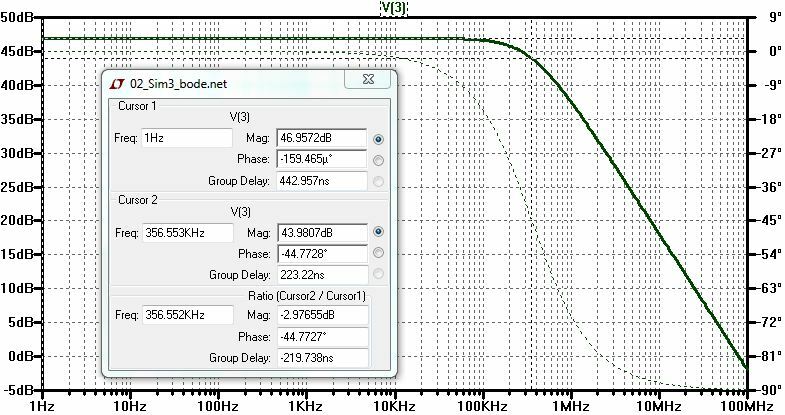 Since we are interested to build up an differential amplifier, the common mode gain should be as small as possible. 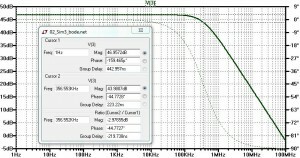 We can calculate the amplification if we connect both input pins together. As both Transistors and Resistors now work in parallel they the resistance is half of the original value whereas the transistors become twice as strong which means that we can double the Width/Length ratio. As you can see this is now a common Source stage. from which we can derive the formula for our amplification. You can see from that equation that an infinite would lead to no common mode amplification as it would be an ideal current source. 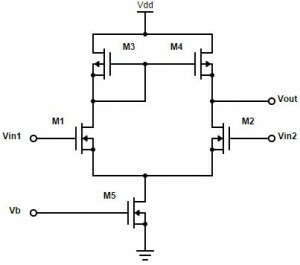 Transistors are not ideal because of several reasons during manufacturing therefore an 2 equal input values must not result in equal output voltages. 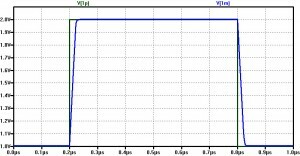 We therefore add an Offset Voltage to compensate this problem. is usually in the range of 5-20mV. In real live the difference of the input voltages is amplified and a voltage which is proportional to this difference is generated. Note that is limited to as upper bound and as lower bound. We also want to be able to amplify "negative" voltages, therefore we lower to a negative value. 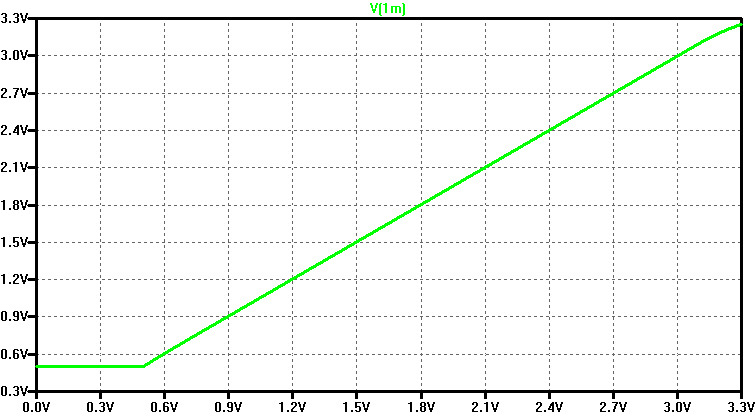 We can achieve the same effect by adding an offset to the input voltages. However, if we do so we generate a new reference voltage, analogue ground which is 0V and in the middle between and . We could change the circuit from fig1 in such a way that we just ignore one of the output voltage. The Problem with that is that both output voltages "move" in the opposite direction when the input voltage difference changes. 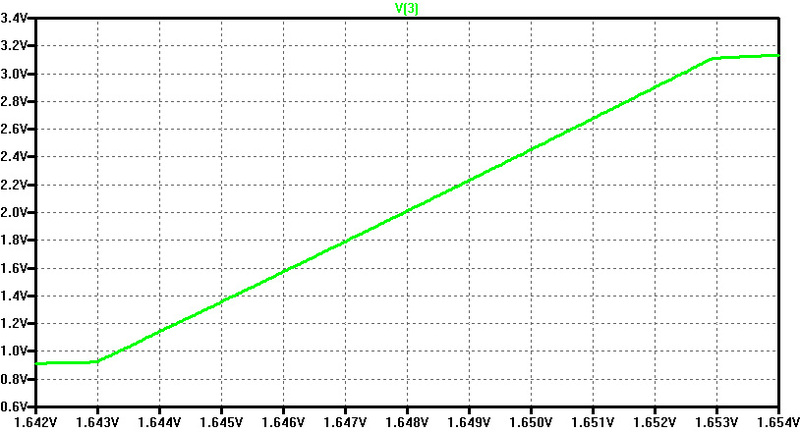 By losing one of this voltages the gain would drop by 50%. A better solution is to use a current mirror as pull up network. The current in ( ) is increasing while the current in ( ) is decreasing by the same value. But at the same time the voltage over is decreasing which is pulling gate node of the current mirror to ground. This will cause the currents in and to get bigger which is also causing the output voltage to rise. Also you can see that I have replaced by a NMOS. The reason is that resistors are difficult to manufacture on a chip. The bias voltage determines the "resistance" of this pull down network. where is the transconductance of the differential inputs. As mentioned earlier and need to be in saturation, therefore the input voltages need to be in a certain range. We have to find the highest and lowest possible input voltage for which and are in saturation. The maximum common mode voltage is the same as the gate voltage at . It is minus the voltage drop over Source to gate plus the threshold voltage of . determines the minimum voltage as also has to stay in saturation. 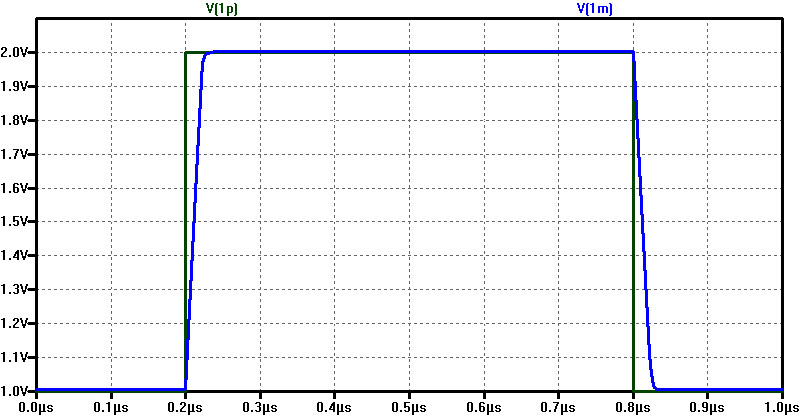 We dither a constant input voltage (which is inside the ICMR) with a AC voltage. The 3dB frequency is the frequency of the AC voltage at which the output signal of this AC is only 70% percent. It is determined by the output resistance. With knowledge about we can set a lower bound which is considering the channel length modulation factor. To have some margin we set . 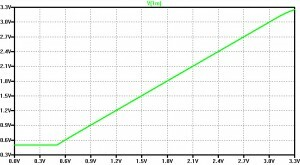 From the gain specification and from the knowledge about the currents we now can calculate the W/L ratio for M1 and M2. I use LTSPICE for the simulation. First I want to check if the offset voltage and the transfer characteristics. We set the negative input to analog 0V and sweep the positive input. 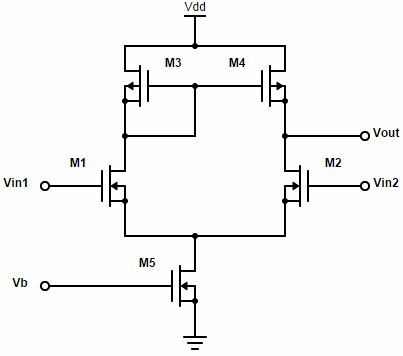 We do have an offset but as we are in the linear region this can be fixed by adding an offset voltage of about 3,5mV to the negative input. 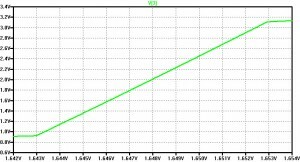 It also can be seen that a 0,001V change of the input voltage results in a 0,2V difference at the output, so we have met our design goal for an Amplification factor of 200. Not we want to check the range of operation if we connect the output to the negative input and sweep the positive input. In this configuration we want to see at which frequency the AC is not amplified anymore. We have a -3dB frequency of around 355kHz which is better that the requirement of 200kHz so we also met this criteria. How fast can the capacitive load be charged and uncharged? so also the slew rate is better than our requirement.